US President Barack Obama has announced that US armed forces have been deployed to Cameroon to help fight against the Islamist militants Boko Haram. The force, which will be 300 strong, will conduct airborne intelligence, surveillance, and reconnaissance operations in the region. 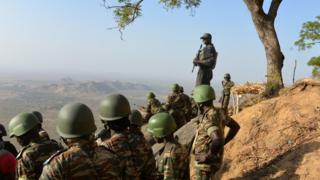 Cameroon and Chad have been targeted by the Islamist militants from northern Nigeria. Mr Obama said the forces would remain in Cameroon until "no longer needed". In a notification to Congress, he said an advance force of 90 troops were sent to the country on Monday. He said all US troops there would be "equipped with weapons for the purpose of providing their own force protection and security". The US has recognised the increased threat its allies and interests in the region face following Boko Haram's absorption into Islamic State. The jihadist group has shown itself resilient in the face of military operations by the combined armies of Cameroon, Chad, Niger and Nigeria. Little has been seen or heard of the African Union-backed Multinational Joint Task Force mandated to spearhead the counter-insurgency mission. Hence support from the US - and France - is crucial at this time. Last year, US surveillance planes and personnel were deployed in north-east Nigeria after the kidnap of more than 200 schoolgirls who are still missing. This time, away from the global scrutiny the Chibok abductions brought, other US soldiers are deployed elsewhere in the region with similar roles. It's still early days but this deployment could revamp the gathering of intelligence, and maybe prove a game changer in finding the core Boko Haram leaders who are keeping the jihadist campaign active. White House spokesman Josh Earnest said the mission would be "part of a broader regional effort to stop the spread of Boko Haram and other violent extremist organisations in West Africa". US surveillance planes and personnel took part in the search for the Chibok schoolgirls in north-east Nigeria last year, but this is the first US deployment envisaging any sort of combat engagement with Boko Haram. Cameroon has become a target for Boko Haram militants since backing the Nigerian military in its fight against the group. Two female suicide bombers killed nine people and injured 29 in an attack on Kangaleri town in far northern Cameroon on Sunday.